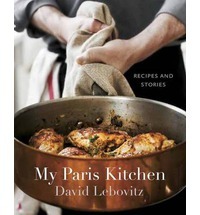 David Lebovitz’s My Paris Kitchen is a masterpiece. Like most cookbooks of today, it’s full of delicious-sounding recipes and gorgeous photos, but what makes this book special is Lebovitz. His writing is fluid and engaging, as always, but his love for his adopted city and food raises My Paris Kitchen to another level. Lebovitz’s storytelling chops are on grand display as he paints word pictures of his Paris apartment and trips to the markets; his recipe instructions are clear, concise, and easy to follow. I also love that he doesn’t focus exclusively on traditional French cuisine, instead giving the reader a feel for what it would be like to be a guest in Lebovitz’s own kitchen — multicultural influences and all. I plan on trying several recipes from this book, and that is something I have never said about a French cookbook before. I just loved reading My Paris Kitchen from start to finish and will do so more than once. I highly recommend this book to anyone who enjoys conversational cookbooks, French cuisine, or just flat out great food writing.